The citizens of Burkina Faso have clearly demonstrated to their fellow Africans that “when spider webs unite they can tie up a lion”. Their actions cast light on the urgings of African bishops’ 2013 pastoral letter on “Governance, the Common Good and Democratic Transitions in Africa”. It points to the big gap between the people and their governments; and calls on governments throughout Africa to establish a dynamic and functioning partnership to bridge the deficit and facilitate public space for their citizens. Failure to do so is to continue to entrench a culture of corruption which the bishops describe as “a cancer that stands in the way of Africa’s development”. The bishops emphasize the need for ongoing formation that nurtures cultures of human rights and good governance so as to “promote the common good”, and caution that failure to give citizens a voice on how they are governed is detrimental to peace, since “to deny the people participation is to encourage violence”. The recent events that unfolded in the public square in Burkina Faso testify to the bishops’ prophetic statement. Blaise Compaoré ruled Burkina Faso for about 27 years, systematically suppressed alternative voices, surrounded himself with sycophants at home and abroad; and despite warnings from the Catholic Bishops, Traditional Rulers and Civil Society Organizations in Burkina Faso not to tamper with the constitution, was determined to amend the constitution to enable him continue staying in power. 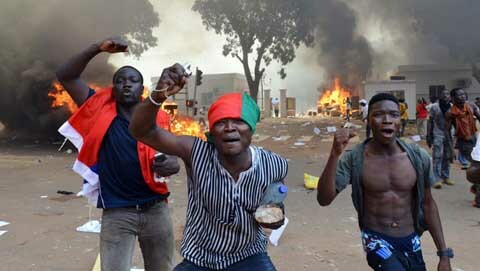 But the citizens of Burkina Faso had enough. In late October 2014, women, youth and men assembled and sent a strong message to Blaise Compaoré that the president is president thanks to the citizens. Their action displays the use of the people’s voice in practical terms. Many African presidents fail to realize that they are employed by the citizens; the citizens to whom they are accountable, to whom they must listen, whose rights and dignity they must protect, and whose common good they must uphold. The Africa Faith and Justice Network is working steadfastly with the church in Africa to form local communities imbued with the principles of good governance. The event that forced Blaise Compaoré out of office after 27 years of iron-fist rule is indeed a real milestone in the democratic process in a country classified as one of the poorest in the world and a great lesson for the rest of Africa, especially those with self-perpetuating rulers. Given the historic importance of this event, the Africa Faith and Justice Network in collaboration with the Advocacy Network for Africa reached out to the organizers of the peaceful protest and were granted interview by Simon Compaoré, one of Burkina Faso’s seasoned politician and a key player in the ouster process. He was for over fifteen years the mayor of the capital city Ouagadougou, and a former senior member of the executive committee of Blaise Compaoré’s former ruling party, the Congress for Democracy and Progress (CDP).